Monkeybicycle is featuring an IF MY BOOK piece for Descriptions of Heaven. Read it here. While you’re here, I’d like to remind you that there’s a giveaway hosted by happymeerkatreviews going on until the first of the year. Win a signed copy of Descriptions of Heaven and a flash drive loaded with extras. Multiple second place winners will win flash drives with said extras. Enter yourself in this contest here. Descriptions of Heaven is officially released. Thanks to everyone who put in their effort, advice, and emotional support—all of it helped to get this book out into the world. I appreciate every single person who buys a copy. Selling books is how we authors make our living. And while it may be a while yet before I can live off book sales alone, every book you buy helps. Thank you so so much. Book blogger, wordsmith, and author Victor G. Espinosa conducted an interview with me about my newly released novella, Descriptions of Heaven. He also wrote a stellar review. About the interviewer: Victor G. Espinosa is the author of Greyhart, a novella. His short stories have appeared in various magazines and anthologies. “Extra! Extra! Read all about it.” Well, it’s not actually all of it. Just some of it. An extract of Descriptions of Heaven is now up on the famous chocolatenwaffles book blog. Click here, read, enjoy. Once you’ve whet your appetite reading the little extract, you can order a copy of Descriptions of Heaven here: available in paperback or ebook. Here’s some of the other great things Donna, the book blogger behind chocolatenwaffles, has said about Descriptions of Heaven so far. Thanks for reading, everybody! A link to Donna’s review will be found with other review quotes once it’s up on the 15th. Cayce Berryman, an editor with a passion for words and helping writers refine and discover their voice, conducted an interview with me about my forthcoming novella, Descriptions of Heaven. About the interviewer: Cayce Berrbyman is a freelance editor, copy editor and newspaper producer for Gannet (USA Today Network). She holds a degree in Journalism from Del Mar College and bachelors in English and Creative Writing from Southern New Hampshire University. Watch the unboxing of the advance release copies of Descriptions of Heaven. Now available on Amazon. It’s time. The long awaited first book cover reveal. First, a little about the book. Descriptions of Heaven wasn’t originally intended to be a book. It was a writing exercise, at most a short story. I started, as I do with most things, at the end. The last line. As many of you know, this book is—in part—about a lake monster. This central image came to me after a night of rare insomnia. The next day, still unable to sleep or function in any appreciable way, I sat on the couch binge-watching a monster hunting show that was having a marathon run. And it was with one of these episodes that the muse decided I’d find inspiration. The particular episode featured, of course, a lake monster. It wasn’t the Loch Ness Monster we are all familiar with. No. It was another lake with another monster. In fact, the show’s host mentioned a number of lakes with legends of monsters lurking in their depths, and, if my memory serves me right, the number was in the hundreds. Thus the beginning (or rather the ending) of Descriptions of Heaven. I’m not going to reveal the ending of the book here. What I will say is that I got off my back, took my sleep-deprived self down the steps to the basement where I had my writing desk, and I wrote. And I wrote. And I saw it was more than a writing exercise. 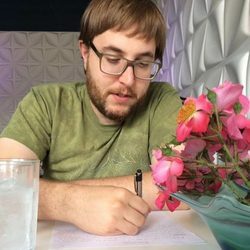 So I wrote more. And I saw that whatever it was, it was a thing with chapters. And I wrote. And as I wrote, it became this little, lyrical novel: Descriptions of Heaven. I wrote the first draft between winter 2012 and spring 2013. Since then I’ve picked it up to revise and put it away a few times. And it was last fall that I finally decided it was ready to be sent out in search of a publisher. And the publisher I went with, Harvard Square Editions, has sent me a finalized cover. For my IRL Facebook Friends I’ve given a sneak peak of this cover, using an unpolished version of the main artwork as my cover photo without telling anyone (kind of an Easter Egg for those I know) for a few months now. [EDIT] You can now purchase the book on Amazon! My début novel, Descriptions of Heaven, will be available November 22nd. There’s still a lot of work to do before this book makes it to the shelves. The team at Harvard Square Editions is busy finalizing a cover and approving the back cover text. Info on pre-ordering will be posted as soon as I get the word. Keep a look out for giveaways and contests. Follow, subscribe, and all that jazz to ensure you don’t miss out. I’ve shared this on my facebook page but I wanted to share this on my blog too. I remember when the Google Maps car drove by my house in 2012. I was sitting on the porch, working on my novella, Descriptions of Heaven. Google did not intend it, but they captured a moment of history in the making. It’s so amazing to me that I am now working on final edits for the book. If all goes as planned, Harvard Square Editions should have the final draft of my book to review sometime late this month or early December. I can’t wait to have this work in print for all my friends and fans. I’ve had so much encouragement and support that it’s going to be rewarding to see the fruits of everyone’s input and positivity in the form of a book. You’re all the best—both my new fans and my old fans—and I can’t wait to give you something polished and printed to read.